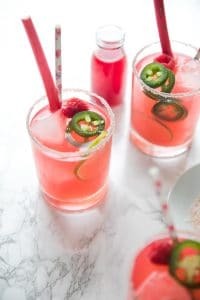 Pretty in pink, these Raspberry Rhubarb Margaritas are a little bit spicy, a little bit sweet, and the perfect cocktail for any occasion. Place a small saucepot over medium-high heat. Add all ingredients for the Raspberry Rhubarb Syrup to the pot and bring to a low boil. Reduce heat to low and simmer for approximately 10 minutes, or until rhubarb is soft. Remove from heat and allow to cool. Mash the rhubarb and raspberry with the back of a fork or wooden spoon and strain mixture through a fine-mesh sieve, extracting a much juice as possible. Set aside in the refrigerator to cool. Place a thin layer of flake salt on a small plate. Rim glass with lime juice and dip each glass into the salt. Set aside. Fill a cocktail shaker with ice and 2-3 jalapeno slices. Add the tequila, lime juice, and homemade raspberry rhubarb infused syrup to the cocktail shaker and shake vigorously for 15 seconds. Fill prepared glass with ice and, using a cocktail strainer, pour the mixture over the ice. Garnish with fresh limes, fresh raspberries, and Jalapeño slices, if desired. Did you make this recipe?Tag @theforkedspoon and hashtag it #theforkedspoon and please leave your star rating in the comment section on this post.